People back home and here have asked us what our favorite place to visit, or to eat, or what is the most beautiful monastery, etc has been in our first 7 weeks in Armenia. These are impossible questions to answer. Armenia although small in area is the confluence of so many cultures, foods, and ecosystems. History and natural beauty lie across the whole countryside. Although nothing can be named out favorite, the Birthright Armenia excursion to Ohanavank and Saghmosavank Monasteries serves as a perfect example of how Armenia is beautiful in so many ways. Hovhannavank Monastery, completed in 1216, lies on the very edge of the Kasagh Gorge and by itself would be worthy of a days visit; however, we followed up the visit to Hovhannavank by hiking down into and through the Kasagh Gorge to Saghmosavank. We slowly hiked through the gorge following the river, climbing over rocks, and passing through beautiful meadows of wildflowers and dill. Upon our arrival at the top of the gorge, we had one of our many "is this real life" moments in Armenia. In one single location we could see an amazing white horse backed by snow capped mountains, turn to see an cemetery with some ancient khachkars, and look back behind us to see blossoming fruit trees. The foreground was dominated by a flowery meadow with grazing cows in front of Saghmosavank (vank means monastery in Armenian) built in 1221. Exploring the area around the monastery revealed more beautiful gorge views, a monastery lit by an amazing beam of light entering from the ceiling of the church, and then a perfect picnic set up by Birthright staff. Birthright, as is typical, hired a local family to provide us with an exquisite lunch experience. The chicken khoravats (barbeque), lavash, hummus, tabouleh, and rice topped off an already unforgettable afternoon. It is not too often one gets to get an amazing picnic lunch inside of a national geographic article but for us in Armenia it seems to happen once a week and again all we can think and say is that we are so fortunate for the experience. The weekend of May 16th we rode the train to Gyumri (Armenia's second largest city) for a weekend to explore the city and get an opportunity to discover a part of the country without a bus full of 50 people in tow. At the same time the uniqueness of Gyumri's culture and architecture is still apparent today in the countless beautiful details seen amongst the ruins and new construction of a handful of modern buildings. Porches, courtyards, gutters, doorways all attest to the pride people took in making the city stand out. Our experience in Gyumri was only heightened by a delicious, unbelievably affordable dinner at a fish farm where our dinner went directly from pond to grill as well as witnessing lavash (traditional Armenian bread which is very much a staple here) made firsthand. Artsakh: A journey to the "Mountainous Black Garden"
We recently returned from a 4 day excursion to Nagorno-Karabakh (often known locally as Artsakh) which is a disputed territory between Armenia and Azerbaijan whose independence is currently unrecognized around the world. Artsakh, though filled with constant reminders of the war of 1991-1994, is home to some of the proudest, most selfless people who opened up their arms, homes, and dining rooms to help educate, house, and feed our large group of volunteers. We rose our glasses along with our 50 worldly, dynamic, and intelligent fellow volunteers as we listened to their toasts said in Spanish, Russian, German, English, French, Farsi, and Armenian. It is difficult enough at the end of the day to eloquently put words and thoughts to summarize visiting the epic beauty and mind boggling historic sights of Armenia; however, it is the countless small moments of sharing languages, foods, and memories that are both known and foreign to us that has helped truly define how incredible our first month in Armenia has been. Birthright Armenia and Armenian Volunteer Corps have made so many wonderful experiences available to us and our fellow volunteers it is nearly impossible to summarize our last couple of weeks. Hopefully Annie's photos are able to capture some of these once in a lifetime moments, locations, and people. Our experiences here continue to amaze. Since our last update we have been fortunate enough to ride in the world's longest tramway (spanning over 3 miles) over incredible beauty to a mountainside monastery, been hosted (along with 30-50 other volunteers) for several amazing meals by the most gracious Armenian families, rode in the bed of an open air dumptruck to a local winery, and rode all across the absolutely stunning Armenian countryside in buses. We have stood in monasteries created in unfathomable years like 648 AD. We have listened to world renowned jazz pianist Tigran Hamasyan play with Mt Ararat and Yerevan serving as a backdrop and had the chance to serve as local "tour guides" to our good friend Liz (visiting from Phoenix). The ability to summarize all of the sights, sounds, and feelings of our experience on the night march to the Genocide Memorial (Tsitsernakaberd) in Yerevan is honestly impossible. The candlelit march began in Republic Square and continued for over 5 miles filled with chants, music, intense camaraderie and pride. We arrived over three hours later to lay flowers atop a pile over 6 feet high in an atmosphere enveloped in an unprecedented sea of honor, sadness, and remembrance. To share this commemoration with over 100,000 strangers as well as dozens of friends only added to the immensity and importance of this experience. The evening will truly be one we will never forget. The Foundation for the Protection of Wildlife and Cultural Assets (also known as SunChild) recycles the flowers placed at the memorial every April 24th. This year we joined Birthright Armenia & AVC in the volunteer efforts by sorting through the flowers- flower petals are separated, dried and then used to make paper while the stems are composted for use on the memorial grounds. Last night at Etchmiadzin Cathedral we witnessed the canonization ceremony sanctifying ALL of the victims of the Armenian Genocide (Translation: victims of the Armenian Genocide were granted sainthood- an unprecedented move by the Armenian Church). 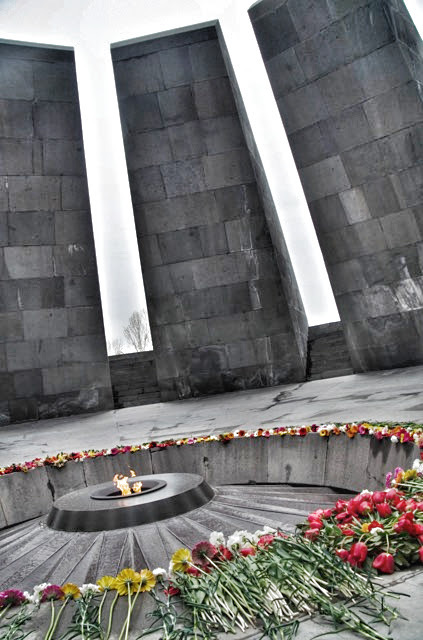 This evening we will participate in a candlelight march to the Armenian Genocide Memorial (Tsitsernakaberd) along with our fellow volunteers and thousands of Armenians to honor the victims and survivors of the Armenian Genocide. For those of you who are interested in reading/seeing/learning more about the Armenian Genocide we have complied a few resources below. Hard to believe we began our adventure amidst pouring rain and thunderstorms in the Midwest already a week ago. After a long journey filled with a predictable flight cancellation and delays once we got to hour twenty six we found ourselves being interviewed by our temporary travel partners/film crew in the Moscow airport. Looking forward to seeing that dreary eyed footage where we share our expectations for what we anticipate when in Yerevan (: Less than an hour upon our arrival in country we approach our new home with cameras in tow and are graciously welcomed by our host family with juice and desserts. Despite exhaustion are so happy to be met with such warmth, smiles, and laughter. With only three days with the documentarians, Stephanie and Joe, we set off to pack a week of experiences into their brief stay. Saturday we shared in a very somber, fittingly drizzly hour with fellow volunteers reflecting and listening to readings at the Yerevan Genocide Memorial (Tsitnernakaberd). The Saturday excursion provided us the opportunity to meet many of our fellow Birthright and Armenian Volunteer Corps (AVC) volunteers. They are an extremely interesting and diverse group that come from all over the world. They currently represent at the very least England, the US, Argentina, France, Jordan, Lebanon, Syria, Australia, and we are sure we must be forgetting some. To hear readings recited in English being translated into Eastern Armenian so that Spanish and French speakers can follow along serves as a great snapshot of how worldly our group truly is. Sunday we traveled with Stephanie and Joe, our host family (minus the birthday girl, Toma), Ani (our translator and friend) to visit some sights outside of Yerevan. In our many world travels it is hard for anything we have previously seen to compare to the absolute beauty, history, and cultural significance of Geghard Monastery. We also visited the Garni Temple which was built in the hard to wrap your mind around, First Century AD. Making the day all the more exceptional was that it was our host grandmother's (Tateek is Armenian for grandmother) first visit to these sights. The day ending there would have been amazing enough but we came home to celebrate Toma's birthday with what seemed like an endless supply of delicious Armenian dishes. We dined with the always appreciative and flexible documentarians, several family members and friends. Countless cheers were shared for Toma, Tateek, and the American guests (including us) with wine and oghee (homemade 130 proof apricot vodka...our esophagi may still be burning). This wonderful night served as a very pleasant welcome and introduction into our Armenian family. We started our language lesson classes on Tuesday. Our host family has also been extremely patient and helpful in teaching us. Although Annie wouldn't think so we have already learned so much since we arrived and can at least speak in basic (very basic) sentences. We have both started at your job placements. Annie is working for the Women's Resource Center of Armenia. They are a very progressive feminist organization in an otherwise patriarchal country where she will quite possibly training teachers how to facilitate sexual health programming (likely to adult women as sexual health in schools is not currently taught). There are a variety of other projects that she will also be getting involved in to help support the center with some of their other programming. John visited his first school Wednesday to observe a group. He will be co-teaching in Sardarapat. The 17 students have a varied level of English comprehensive but all understand most of what we are saying and have a great desire to learn English. They are all very happy to hear I have an Armenian mother! I will teach my first solo lesson today in Hatsik. In all he will be working at three schools (one day each per week) and then be planning/grading, etc in Yerevan two days a week. You mothers reading this will be happy to know that we have the most adorable and caring host mother and host grandmother constantly caring/worrying/feeding/hugging us. We both feel very blessed to be with great organizations, a wonderful family, in Yerevan during such a historic time, and with a great view of Ararat from our room to boot. After a winter of preparing for our volunteering experience in Armenia our departure is finally right around the corner. We have been struggling through learning the Armenian alphabet and vocabulary (we could now tell you green cucumber cold kitchen table for whatever that is worth). We have also been diving into Armenian history through a collection of books as well as pointing out Armenia on a map to many curious friends and family. A pleasant surprise to even us, we have been interviewed by documentarians for an upcoming film, "A New Armenia", set to air next spring on PBS. Our filmmaking friends will be accompanying us to Armenia to chronicle the experience of an Armenian-American and his photographer wife attempting to connect with his heritage. We look forward to seeing our family's story as well as the stories of many other Armenian-Americans on television next year. We will be living with a host family in Yerevan, Armenia for ten weeks while we volunteer. Annie's organization, Armenian Volunteer Corps, will have her focusing on photojournalism projects centered around their 15th Anniversary as well as the Armenian Genocide Centenary. We feel very fortunate that Annie will be able to use her photography skills to help commemorate such important historic events. John will be participating in a travel fellowship through Birthright Armenia (BA). BA has placed him with the Children of Armenia Fund where he will be teaching after school writing classes in English in a couple of rural Armenian villages. BA has weekly excursions planned for volunteers which will allow us to experience many social, cultural, and historical places throughout Armenia. We plan on using this blog to keep all of you updated of our many travels and experiences while living in Armenia. We are so grateful for all the love, support, and encouragement we have received from countless cherished friends and family, especially our loving parents and sisters.